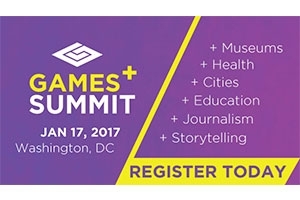 American University Game Lab is gearing up to host the 2017 Games+ Summit on January 17. The summit has six main areas of focus: museums, health, cities, education, journalism and storytelling, and encourages those working in these or any related field to come learn how games can be adapted and integrated. Seminars, panels and one-on-one sessions will provide a unique look into the fundamentals of game design in addition to the cutting edge concepts and ideas that are driving the industry forward. Games+ is free, but registration is required. Attendees will also have the opportunity to meet with some major names in the game industry, including Game Lab faculty. A welcome lunch and networking reception/dinner will be provided, seating is limited. Games+ is being held in Crystal City at the startup incubator, 1776, which is known for its background solving problems related to health, education and cities.For more information and to register, visit Games+ Summit.